In October last year the JDRF announced their Open Protocol Initiative, calling on equipment manufacturers to open up their communication protocols to facilitate the development and uptake of closed-loop (“artificial pancreas”) pump systems. 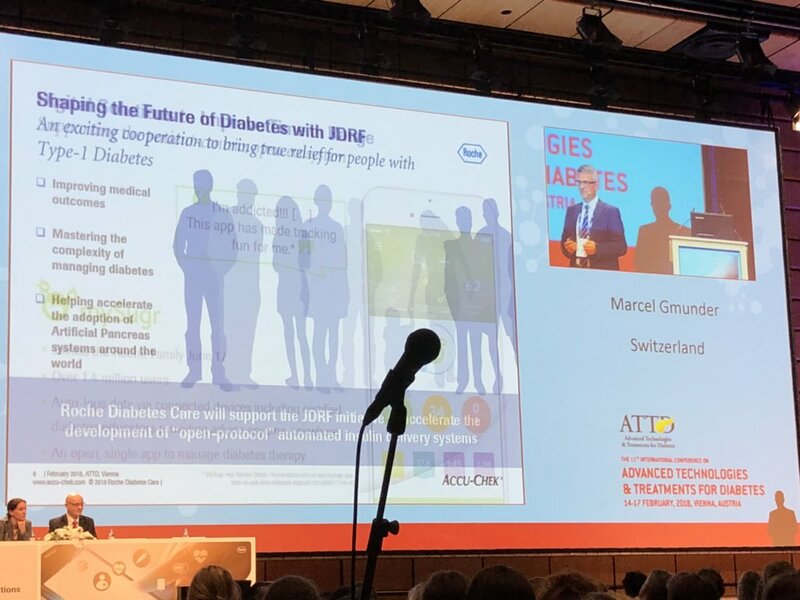 Last week at ATTD Dr Marcel Gmünder, the Global Head of Roche Diabetes Care stood in front of an audience and announced that Roche will support the JDRF Open Protocols Initiative. After SOOIL (who make the DANA pumps) I think they’re the second company that has made such a commitment. This is very exciting news! I’m hoping to find out soon what support it actually translates into for the existing Roche/Accu-Chek products we’re interfacing loops with. They might be able to offer some extra information to allow us to enhance the software further. Dexcom have said they will be releasing their G6 CGM in 2018. Presumably in the US first. We’ve known about this for a while as it’s been in development and then testing for several years now. There are a bunch of new features for the G6, including improved accuracy, self-calibrating, improved run-time (10 days from sensors instead of the current 7, although many of us regularly get 3+ weeks from G4/G5 sensors already), and a new simplified applicator. Last year Dexcom released a new touchscreen version of their G5 receiver in the US which will get a firmware update to be able to talk to the G6 (along with updates to their phone apps). Tandem have been doing some of their clinical trials using G6 sensors, so we assume their pump will also be getting a firmware update that includes G6 support. There’s no information yet on what will be involved to allow access to the G6 from opensource tools such as xDrip+, but presumably this will come eventually. In the meantime both the G4 and G5 systems (they share sensors) are still working well and should tide us over for the next few years. We wait to see when the G6 is likely to reach Australia, and what it’s actually like in real-world use. There was a lot of material presented at ATTD about advanced technologies such as closed-loop pump systems. But there was also some lower-tech presented. One that particularly caught my attention was the Baci Pen from Brazil. This is a 3D-printed insulin pen which will open up MDI (multiple daily injection) diabetes treatment to a massive population who couldn’t otherwise afford it! A new CGM application has emerged for iPhones: Spike. Like xDrip+ for Android phones, Spike can query data from CGM transmitters/sensors including Dexcom G5, G4 (with BT “wixel”) and Libre sensors (with Blucon Nightrider). It also allows off-line operation with the iPhone closed-loop app Loop. I haven’t used it myself, but know a few people testing Spike out. It sounds like a very useful tool! In last week’s post about insulin pumps in Australia I mentioned the up-coming Ypsopump. As often happens with new devices, it now turns out that a few selected users are being started on this pump in the coming weeks, and we expect its consumables will appear on the NDSS list soon, at which point it should be full steam ahead. We’ll hear back with real-world user experiences soon: I’m hoping there aren’t any real UI clangers to deal with. I think folks interested in this pump as an option for a new pump should expect to have to hold on for at least another month or two, but it’s definitely good to see the next pump options finally emerging! Also in last week’s article I mentioned the rumours that a Tandem insulin pump might come to Australia. On a related note, a few days ago we saw the first announcement of the t:slim X2 pump soon to be available in a country outside the USA. The first places will be in Scandinavia: Sweden, Norway and Denmark. Tandem had previously indicated that they were looking at Canada first, but it seems Scandinavia beat them to it. That’s not a complete breakdown of everything that’s happened in the last week, but it is at least some of the highlights. I wonder what announcements will be made next!